OK - I am now an official ticket seller in the Huntingdon's Disease raffle to raise funds for the support organisation which helps sufferers and families of this terrible disease. The prize is one of my BIG crocheted blankets (generous Double Bed size) Tickets are only $1 each - and the raffle will be drawn on July 1st. You can contact me on 04123439014 or PM me on Facebook ( Yvette O'Brien) - I will accept payment through Pay Pal too - my Pay Pal email address is No1grandma@gmail.com. 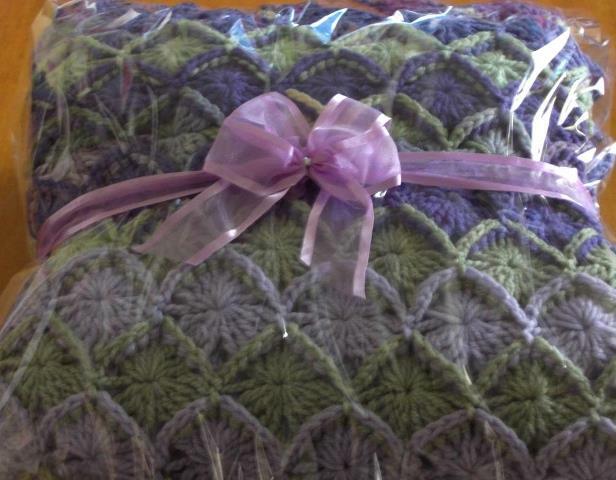 The blanket is made in lavender, with pale green and toning colours - it is shown here on a Queen Size bed. Please help me to raise funds for this very worthy cause - this neurological disease is related to Alzheimers's, Parkinson's and Dementia - THERE IS NO CURE - it is hereditary - and a sufferer's children also have a 50% chance of contracting it..... so please - dig deep into your pockets as only we Aussies can!!! Please go to the link above - Jaime is my friend - and this is the reason this raffle is happening and why I donated the blanket to help raise funds.. I have forwarded payment for purchase of tickets through paypal. The throw is gorgeous! I've sent some money via Paypal, Yvette.